After years of unrelentingly dire news, biologists have found a possible hope for Tasmanian devils, which are threatened with extinction by a contagious, highly virulent form of cancer. A small group in Tasmania’s northwestern tip appears to have survived the scourge largely intact. It’s the first population to do so, and represents the first real sign — however tentative — that the beloved marsupials may survive. McCallum is, along with his co-authors on an Oct. 6 Conservation Biology paper describing the surviving devils, a front-line fighter against devil facial tumor disease, which was first spotted in 1996 when an amateur photographer saw a devil disfigured by huge, boil-like tumors. 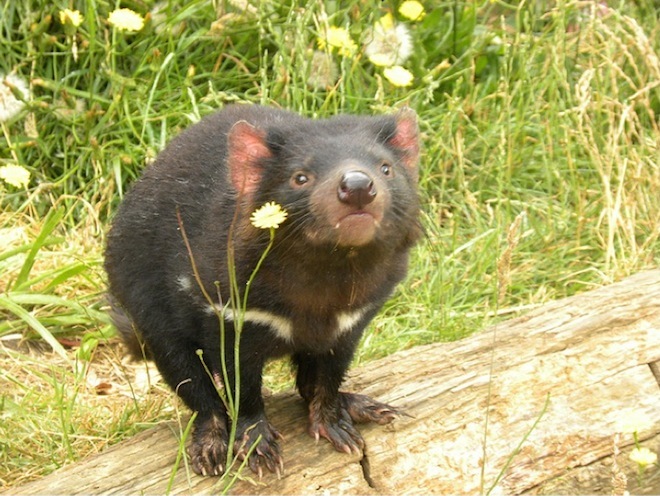 By 2001, roughly 15 percent of Tasmania’s devils, which live nowhere else, were similarly afflicted, and researchers soon learned that the tumors were cancerous, contagious and deadly. They grew uncontrollably and fast around devils’ faces, preventing them from eating. They spread at the worst possible time, during mating. The disease marched across the island; where it hit, up to nine in 10 Tasmanian devils were killed in the first onslaught. They were declared endangered. Scientists said extinction, except for a few individuals kept on species-level life support in zoos, was possible within 25 years. Researchers didn’t know what to do, or even if anything could be done. But they didn’t give up; they set about gathering information, basic facts that meant little at the time but might someday come in handy. One such project was a genetic characterization of Tasmanian devil population structures. In Tasmania’s far northwestern tip, in a 10-square-mile patch of remote mountain forest area called West Pencil Pine, biologist Menna Jones found hints of a genetically distinctive group. More research showed the West Pencil Pines devils had unique immune systems. This was no guarantee of immunity to the cancer, but it was reason to monitor them and hope. McCallum and his colleagues — including Menna Jones and the new study’s lead author, Rodrigo Hamede — started formally tracking the West Pencil Pine devils in 2006. The new findings describe what they found: a population that, four years after the disease arrived, looked much as it did before, though the populations around them have been decimated. They still contract the disease, but in lower numbers, and to far lesser effect. According to McCallum, there are two likely explanations. Devil facial tumor disease might have evolved into a different, less-virulent local form in West Pencil Pine. This would be good news, but not the best news, since the other, highly deadly strains could still arrive later. But maybe, just maybe, the West Pencil Pines devils are uniquely immune. “The best outcome would be that some devils in this population are resistant,” said McCallum. “We might be able to spread the resistant genotypes,” repopulating Tasmania with devils bred from the West Pencil Pine survivors. 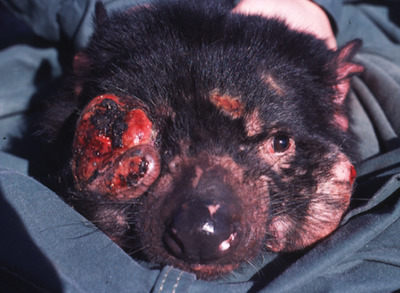 Citation: “Reduced Effect of Tasmanian Devil Facial Tumor Disease at the Disease Front.” By Rodrigo Hamede, Shelly Lachish, Katherine Belov, Gregory Woods, Alexandre Kreiss, Anne-Maree Pearse, Billie Lazenby, Menna Jones, Hamish McCallum. Conservation Biology, Oct. 6 2011.